Rangers have dropped their interest in Motherwell winger Jake Hastie, according to the Evening Times. The Ibrox club had offered the 20-year-old a contract after his deal with the Steelmen expires this summer. However, it’s being reported that they have become tired of waiting for a resolution and have since decided to move on to other targets. It was suggested last week that the contract offer was worth around £15,000 per week, but The Scotsman understands the actual figure was around a quarter of that. Hastie has shot to prominence in 2019 after returning to Motherwell from a loan deal at Alloa Athletic. 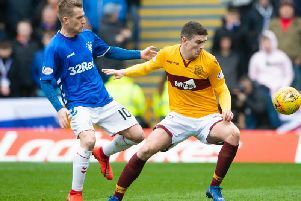 Crystal Palace are also said to be monitoring the attacker, while Motherwell haven’t given up hope of convincing him to remain at Fir Park beyond this summer. Hastie is also understood to have options in the United States.